Steve has always been interested in music and after leaving school in 1976 played in a number of pop / rock bands through until 2004, recording with some of them. Steve also took on promotional and PR duties for most of the bands, something which he found he really enjoyed. In and amongst the live music, Steve also wrote and published a fanzine devoted to one time Rainbow, MSG, Alcatrazz and Impellitteri vocalist Graham Bonnet. ‘Under The Bonnet’ ran through fifteen issues until 1994, and it was during this period that he and Graham got to know one another. In 2007 Steve toured the UK with Graham, handling the merchandise and other aspects of the shows, and has also toured as part of the crew for other bands, including Radio Stars, John’s Children and Andy Ellison in the UK and abroad. Steve also runs the official Radio Stars website. Steve has always had a huge interest in the history and careers of rock musicians and to this end has interviewed many for various publications as well as his own research. His enjoyment of doing interviews has also extended to his other love, football, and he has talked to many footballers and managers about their careers. The idea of writing a book (The Story Behind The Shades) about Graham Bonnet actually goes right back to the late 80s but it wasn’t until recently that Steve started to gather together the many different strands of his research into Graham’s career to bring a biography together. 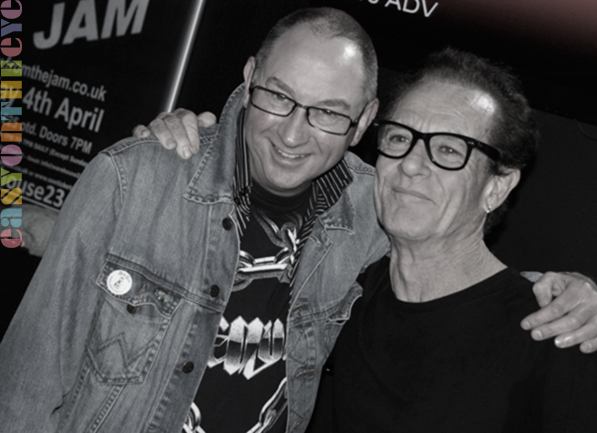 Photo : shows Steve on the left with Graham Bonnet, during the 2014 UK tour.